In the world of cancer treatment, the relative newcomer is medical marijuana, although cannabis has been used in herbal remedies to treat a variety of physical symptoms of illness for many centuries. In America, however, marijuana is still listed as a Schedule 1 controlled substance by the federal government, and not currently approved by the US Food and Drug Administration (FDA) for any medical use, although cannabis is legal to treat medical conditions under state laws in over half the country. A pharmaceutical form of THC known as Dronabinol, and a man-made cannabinoid drug known as Nabilone are currently approved by the FDA to treat some medical conditions. Our bodies house a specialized lipid signaling system called the Endocannabinoid System (ECS), which helps regulate a variety of bodily functions including sleep, appetite, pain and immune system response (1). Our bodies produce endocannabinoids, which are neurotransmitters that bind to cannabinoid receptors in the nervous system. Many people engage in medical marijuana, given there are several benefits of CBD and cannabis. The reason they are used to treat adverse physical symptoms is that the over 100 biologically active components in marijuana, chemical compounds known as cannabinoids, work with the cannabinoid receptors in the body to relieve pain, ease symptoms of illness such as nausea and vomiting, and increase appetite. Using CBD oil for cancer patients undergoing chemotherapy helps to mitigate the pain. The health benefits of cannabinoids are a welcome relief from the often debilitating side effects of chemotherapy and radiation treatment. Studies have shown that one of the active compounds in cannabis, Cannabidiol, better known as CBD, may help reduce chronic pain by reducing inflammation. Another benefit of CBD is that it’s not psychoactive, which means it does not produce the effect of being “high” that is associated with another compound, Tetrahydrocannabinol, known as THC. This quality makes CBD appealing to those individuals who are seeking pain relief and respite from other negative symptoms without the mind-altering effects of marijuana or opioid drugs. CBD oil is one method of enjoying the much sought after CBD benefits in a topical application. This healing oil is made by extracting the CBD compound from the cannabis plant and diluting it by combining it with a carrier oil such as coconut oil, avocado oil, or hemp seed oil. 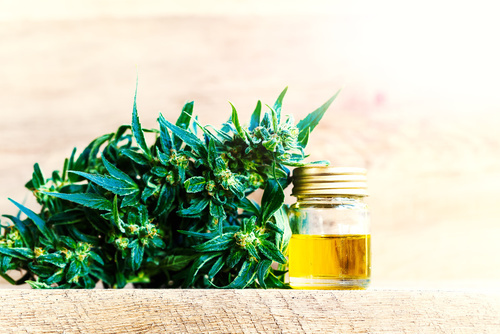 CBD oil is rapidly gaining momentum in the health and wellness world, with some scientific studies confirming it may help relieve conditions like chronic pain and anxiety. Some cancer patients use CBD oil to help ease the physical pain caused by cancer and various treatments without the high that accompanies THC. If you are interested and would like to schedule a medical marijuana consultation with one of the experts at our facility, please contact our MMJ clinics in Colorado Springs or Pueblo. If you have any questions about the proper application of medical marijuana for your situation, please contact us at (719) 246-0393 or email us your questions at: hello@medicalalternativesclinics.com. We offer convenient same day appointments for current and prospective medical marijuana patients and we can help you get your MMJ Red Card in three days or less!